Lexi, Nitro, Tallulah, Bailey, Bud and I are excited to participate in this weeks Saturday Pet Blogger Hop! Special Thanks goes out to our Pet Blog Hop hosts, Life With Dogs, Two Little Cavaliers, and Confessions of the Plume! 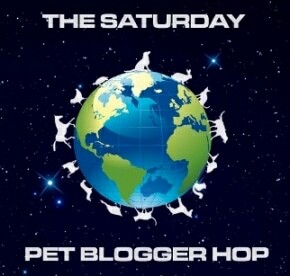 If you would like to read some entertaining pet blogger posts in the Saturday Pet Blogger Hop, just click on one of the host links above or click on the badge to the right with the animals circling the Earth that reads The Saturday Pet Blogger Hop. Happy Hopping! My love of doing dog and shadow photography started in November of 2010 when I got my first deaf puppy Nitro from the City of Salem Animal Shelter. I took the photo of Nitro in his blue sweater with his blue DEAF DOG tag and his big dog shadow and I was totally hooked! Below is Nitro's very first puppy shadow photo I took in November 2010. Below Nitro's puppy picture are some "Doggy Dark Shadow" photos I took this week (Nov., 2012). It's as if the shadows tell their own stories for example in Nitro's puppy shadow photo, the shadow seems to say "I'm going to be a big important dog some day" and it seems his shadow was dead on! It's been two years since we brought Nitro home to Bluebird Farm. Happy 2nd Dogiversary to my sweet Nitro the CED (Chief Executive Dog) here at our sister blog DeafDogsRock.com. He has changed our lives forever by giving us a special purpose of helping deaf dogs and their owners. Happy Blog Hopping and thank you for hopping by! Photo: 10 week old deaf white rescue boxer Nitro his first week here at Bluebird Farm November 2010. My sweet foster failure 12 month old deaf white boxer boy Bud. Bud with some of my graphic special effects. My two handsome deafies and their big guard dog shadows! Look at Nitro's cute nub of a tail in his shadow...such a handsome boy! Lexi and her sweet "big girl" shadow! "Moma, did you say treat?" Nitro looking at Bud "Dude seriously?" The lines in Bud's forehead are his worry lines..he worries a lot. Nitro's blue eye is his special brand. Okay, I admit it, I just love to take photos of Nitro's blue eye! My little Sun Goddess Tallulah! I love her curly tail in her shadow! While the Turkey was cooking in the oven, we decided to take Nitro and Bud on a nice long walk on the Salem Greenway. It was a beautiful 60 degrees out on Thanksgiving Day and we really enjoyed getting out and about in the woods. Nitro is looking at me as if to say "where are all the ducks mommy?" Nitro checking out the cyclists on the Salem Greenway. Such a pretty backdrop don't you think? My handsome deaf boxer boy Bud. He just turned one and he came to live with us the first week of September. He is what we all call a "foster failure" and now I am totally outnumbered with five dogs! I would caption this photo "Bhahahahaha, I made it out of the shelter and I bet those folks who dumped me as a puppy at the river never thought I would end up being the head dog at Deaf Dogs Rock and saving deaf dogs from death all over the country!" I love taking photos of my boys by the little red caboose! I decided to add one shadow photo of me and my sweet boy Nitro. He is such a pleasure to walk with on the Greenway. Bud catching some fresh air in the back of the pickup truck on the way home from our walk. "hmmm fresh air smells so good"
Bud has a hard time breathing because of his small air passages so he opens his mouth to "gulp" in the fresh air. Tallulah is Nitro and Bud's side kick. She thinks she is a boxer in a small package. My little Tallulah and her sweet little shadow. I love her curly tail! If there was a dog GQ, I think Nitro would make a great cover model! Bud Chillin like a Villain! I caught these shots just as I was getting ready to upload the shadow photos. The sun was low and it was just perfectly hitting Bud for some nice warm sunset shots. He was very relaxed and ready to take a nap. He looks like an Angel from Heaven in this shot. I love the backdrop of the Boston Terrier painting by Svetlana Novikova in the background. These are my babies and I am so blessed to have all of my dogs, my sweet husband, my wonderful horses and have the good fortune to live here on Bluebird Farm. What a stunning set of pix. They really are awesome pawsome. Have a super Saturday with all your loved ones on Bluebird Farm. Thank you Molly The Wally! Beautiful pictures and beautiful dogs! Happy dogiversary!! Thank you! Thanks for hopping by! Hope you and all the pups had a delicious Thanksgiving! Love the photos from Salem Greenway. Such a glorious November day! I love the shadow concept and you have beautiful dogs for your photos. Thank you Nanny McFur. We sure had a good time! Christina I so loved looking at this gallery this morning. I agree that Nitro is the best executive rocker ever!!!! Thanks for the smile this morning! Thank you Denise. We have been having a BALL! Thanks for hopping by! Looks like everyone in your house is having a thankful weekend. We are truly blessed and we are so thankful. Thank you so much for hopping by! Thanks Benny and Lily. You are right they are total "posers" because I am always taking pictures of them. Thanks so much for hopping by! There are different types of video production companies available in the market, but if you are searching Dubai best video production services to make a unique video, you can search online. With online search, you can get complete details of their services, products and efforts. You can also check reviews online and accordingly select a service provider. Gold Crude Research and advisory provides Best services MCX Tips, goods Tips, Bullion Tips, Gold Tips, Silver Tips Comex signals and gold crude research offers GOLD COMMODITY TIPS, MCX GOLD MARKET CALLS. Physics is really difficult to understand as it is a branch of science concerned with the properties of matter and energy. Physics is all about the imagination. It has lead to many great discoveries around the world. Our whole life is now consisted by such things that are discovered by physics. Physics has lead humans to a new path that no one had even dreamt about.